NEW YORK -- The wild ride on Wall Street is continuing, but for a change, the stock market roller-coaster headed higher on Friday. By the early afternoon, the Dow Jones industrial average (^DJI) had soared by 300 points, moving back above the 16,400 level and erasing a large fraction of its big losses from earlier in the week. Still, the blue chip index is down nearly 900 points from its record high of 17,279 on Sept. 19. That's a drop of more than 5 percent. The broader S&P 500 (^GPSC) was up around 1 percent at 2:30 p.m., but is still down about 6 percent from its all-time peak. 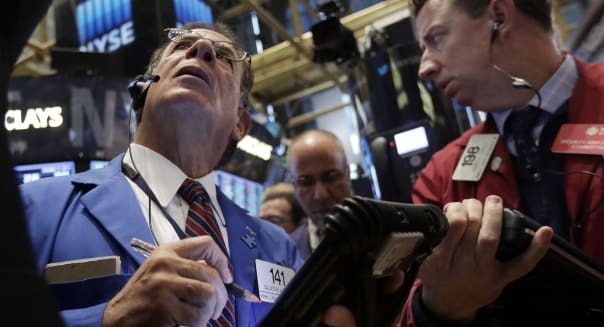 Trading remains extremely volatile, and analysts say any reports of bad news, either here at home or overseas, could roil the market, sending it into another tailspin. However, many believe that the quick blowout we witnessed this month may be just what the market needs to reset and before it starts another longer-term move higher. In a letter to clients, U.S. Trust says it believes a "bottom is building" that should lead to solid gains by the end of the year. It believes the S&P 500, which began the day virtually flat for the year, will end the year with a gain of about 7 percent. That would put it back near 2,000. It's not likely to be a straight line upward though. Many technical analysts say the major averages are likely to re-test their lows from earlier this week. That means they are looking for the market to re-confirm that there's a solid floor, and establish a strong base for the next leg of the long-running rally. The bull market has been underway for five years, and there hasn't been a 10 percent correction since October 2011. That is nearly double the length of the average run without one, but the bulls are convinced that the rally will continue well into next year. Friday's big gains come on the heels of upbeat earnings news from bellwether companies such as General Electric (GE), Honeywell (HON) and Morgan Stanley (MS). Next week is one of the busiest on the quarterly earnings calendar, with results due from Apple (AAPL), Boeing (BA), Yahoo (YHOO), General Motors (GM), Amazon.com (AMZN) and hundreds of other companies. Analysts say that strong earnings and positive outlooks for the rest of the year could provide the spark needed to restart the rally. Investors are also keeping a close eye on events overseas -- both economic and political. There were indications from Europe on Friday morning of new stimulus efforts may be on the way from the European Central Bank, as well as signs that interest rates will remain low. In addition, energy prices are at their lowest level in more than a year, which could give a lift to many industries, and boost consumer confidence. The Thomson Reuters/University of Michigan preliminary index of consumer confidence this month unexpectedly rose to its highest level in seven years, helped by the sharp drop in gasoline prices and improvements in the labor market. The note from U.S. Trust advises its clients that "periods of equity weakness in the coming weeks" could provide some good buying opportunities for investors.